The 2015–2020 Dietary Guidelines for Americans is designed to help Americans eat a healthier diet. Intended for policy makers and health professionals, this edition of the Dietary Guidelines outlines how people can improve their overall eating patterns—the complete combination of foods and drinks in their diet. This edition offers five overarching Guidelines and a number of Key Recommendations with specific nutritional targets and dietary limits. An eating pattern can be defined as the combination of foods and beverages that make up an individual’s complete dietary intake over time. An eating pattern is more than the sum of its parts; it represents the totality of what individuals habitually eat and drink, and these dietary components act synergistically in relation to health. A healthy eating pattern should be tailored to the individual’s personal, cultural, and traditional preferences as well as food budget. An individual’s healthy eating pattern will vary according to his or her calorie level to help achieve and maintain a healthy body weight, support nutrient adequacy, and reduce risk for chronic disease. Healthy Mediterranean-Style Eating Pattern – This pattern is adapted from the Healthy U.S.-Style Pattern, modifying amounts recommended from some food groups to more closely reflect eating patterns that have been associated with positive health outcomes in studies of Mediterranean-style diets. The Healthy Mediterranean-Style Pattern contains more fruits and seafood and less dairy than does the Healthy U.S.-Style Pattern. 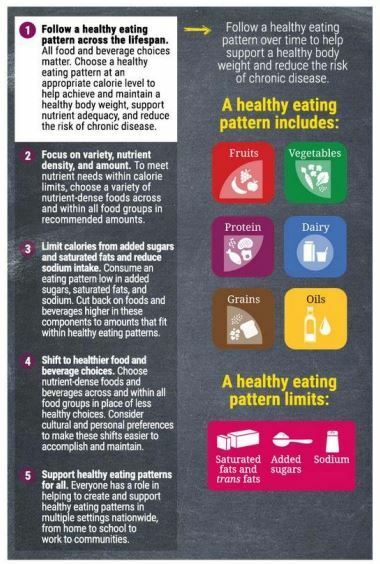 Healthy Vegetarian Eating Pattern – Adapted from the Healthy U.S.-Style Pattern, this pattern modifies amounts recommended from some food groups to more closely reflect eating patterns reported by self-identified vegetarians in the National Health and Nutrition Examination Survey (NHANES). Dairy and eggs were included because they were consumed by the majority of these vegetarians. This pattern can be vegan if all dairy choices are comprised of fortified soy beverages (soymilk) or other plant-based dairy substitutes.